Paint The Barn Red: a few projects. I think I have really learned some things lately. A few weeks ago, I had felt like I was at my wit's end. Expecting way too much out of myself to the point that I was making myself miserable. But I make it a point now each morning to tell myself what I want to get done "today". Not, "Oh I can just see it now, our informal living room carpeted, with built-ins put up and filled with nice decorations that I made, and the house spotless, and all the rooms painted and properly furnished, and..."
While it's good to have long term goals, and an end-vision in mind (especially when working on home decorating?! ), too much of this fantasizing about "what it will look like in the end" is dangerous. ...it makes you feel worthless. While I still have an end goal in mind to help me choose paint colors, and what furniture will go in what rooms and so on, I try now not to focus on the end goal being right here and right now. After all, what else do I have to do with my time? We don't have kids yet, so why am I trying to rush this season of life that I have been looking forward to since I was a little girl*, hoping it will all just be put together and pretty in the blink of an eye? *I never fantasized about meeting Prince Charming when I was growing up, or what my wedding day would be like. I fantasized about painting every room a different color, hardwood flooring, throw pillows and couches and what the floor plan of my dream home would look like. I want to enjoy this time while I still have it. This time where I am married, and a housewife, and have all day to work on house projects if I want to. I know the projects and planning won't stop once we do have kids, but it will take longer to finish any projects started once there are littles running around. Again, I want to enjoy this time while I still have it. I'm reminded that it's precious and I don't want to be in such a rush to get my house put together so much that I miss it. So I've been doing things a little differently. Each morning when I wake up, I notice what needs to be done. For example, laundry, dishes, cleaning the counter--maybe unpacking a small amount of stuff. I get to all that--but then I also plan to work on a house project each day too. It can be anything: painting a room, making curtains, choosing paint colors--you get the idea. When I make these small goals for myself that are comprised of both general house cleaning and moving in, as well as working on some house projects to help get the house looking more lived in and put together, there is a nice balance. The balance of work and play. I figure on painting a room one day, doing the second coat the next day, taking off the tape and arranging the furniture in the room on the third day. It makes it feel much more manageable than trying to make a mental list of all the things you want to do in the entire house and hoping somehow it will get done by the time your husband gets home. I love that I have been able to come to this mode of thinking. I feel like my life has a lot more balance. I remind myself that waiting will give me something to look forward to in the morning. I wake up every morning excited for what is to come. I started working on our Christmas cards (!!!) I've never made Christmas cards nor have I ever been the person to send them out so this has been really exciting. It seems silly, but I love that we're using some of our wedding photos to send to our family for Christmas this year. As of today, I completed painting and arranging some furniture in what was originally dubbed in our house as "the blue room". We'll have to come up with another name for it now. Blog post on that later when it's a little more put together. 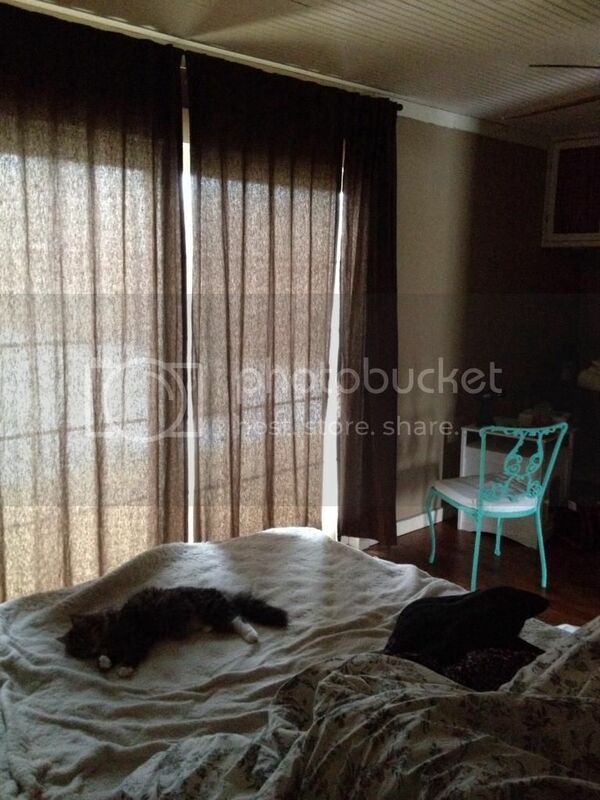 Earlier this week, I hung the new curtains we got from Ikea during our trip to California. This is another thing I love. Can I somehow express how much a difference it makes in our room? 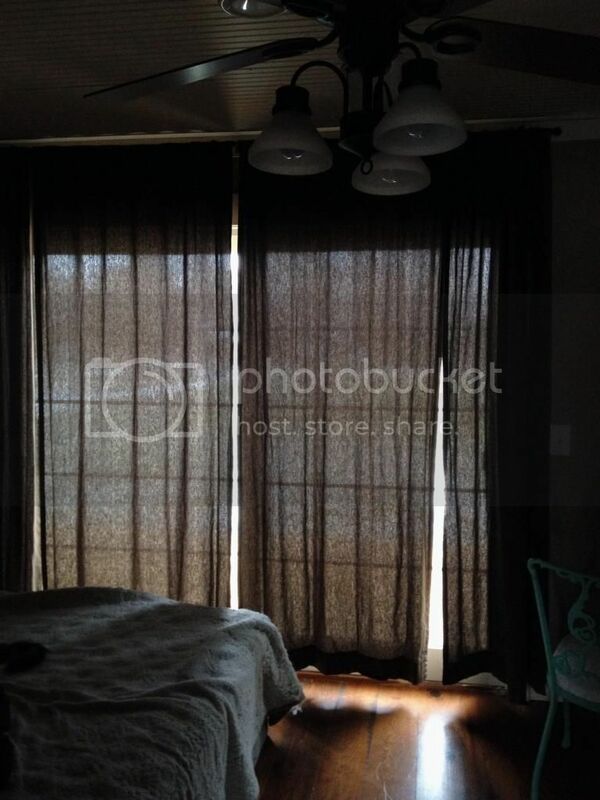 The original curtains were true to the definition of the color "brown". You couldn't be more straight forward about it. Even in the day time if they were shut, the room was so dark you could hardly see anything. Our bedroom has sliding glass doors on the front of the house. So unless we were to want our life to become a remake of The Truman Show and have our neighbors (on a peaceful, delightful, morning walk, undisturbed) see us rolling out of bed with epic bed head at 7:30 in the morning, you would want the curtains closed. But having the curtains closed at almost all times and resorting to having a dark bedroom isn't all that great either. What a difference! All the privacy you need but they stream in so much light, you can't help but wake up with a smile on your face every morning. And the neighbors on a morning stroll don't have to be traumatized by your groggy morning face. It's great. Even the newest addition to our little family, Daisy May Whovier (Daisy, for short) approves of the white curtains. 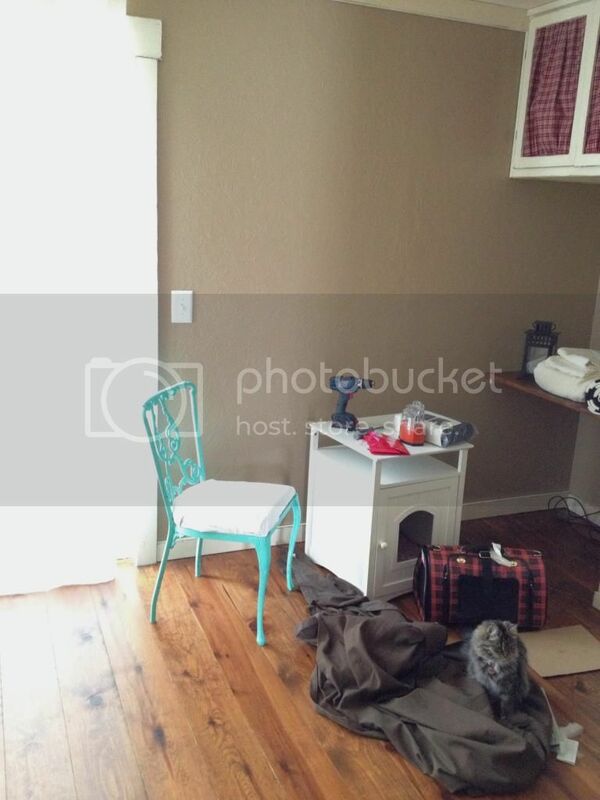 Notice she is sitting on the brown curtains. Because she was not pleased with them. Not one bit. 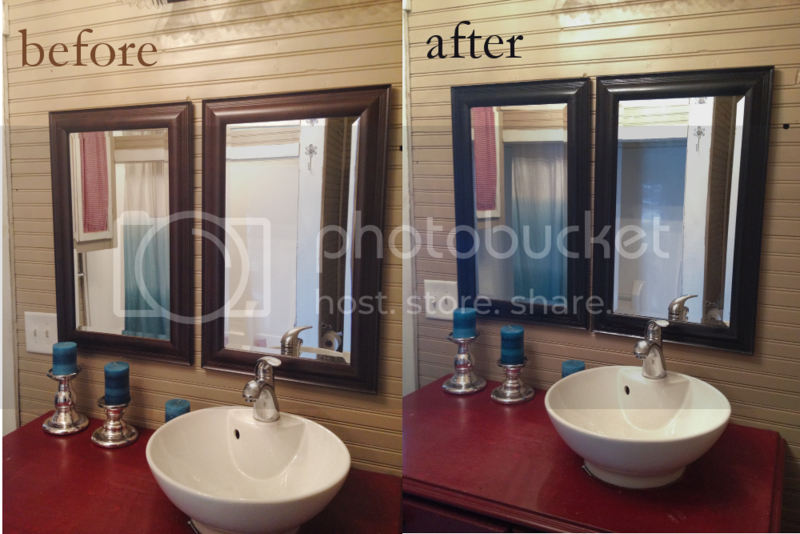 I also painted the frames of two mirrors in the master bathroom. 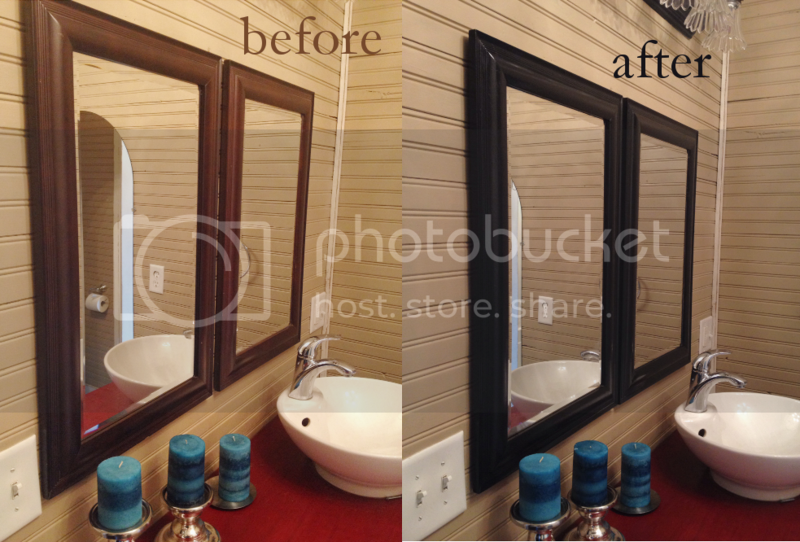 It's not a huge difference since the mirror frames were already dark, but it was a quick and easy fix to make our bathroom look a little more put together. I think the bathroom will be painted lighter too at some point to make the black vanity lighting and the black chandelier (not pictured) stand out a whole lot more. That bathroom has a lot of small projects to be done on it, but what room in our house doesn't at this point? I'll just be taking it in stride, one day at a time.